It's another blog hop! Today, it's the Warm And Cozy Winter Blog Hop hosted by Lisa at Honeybearz Designs. You should have arrived here from her blog. If not, you'll want to be sure to start there to get all the details on today's hop, including the blog candy. I love gift bags and always have a stash on hand. The plain Kraft ones are always handy to have so you can decorate them according to the occasion. That's exactly what I did for a cocoa gift set. It's a super cute mug and two packets of Salted Caramel Hot Cocoa. YUM! 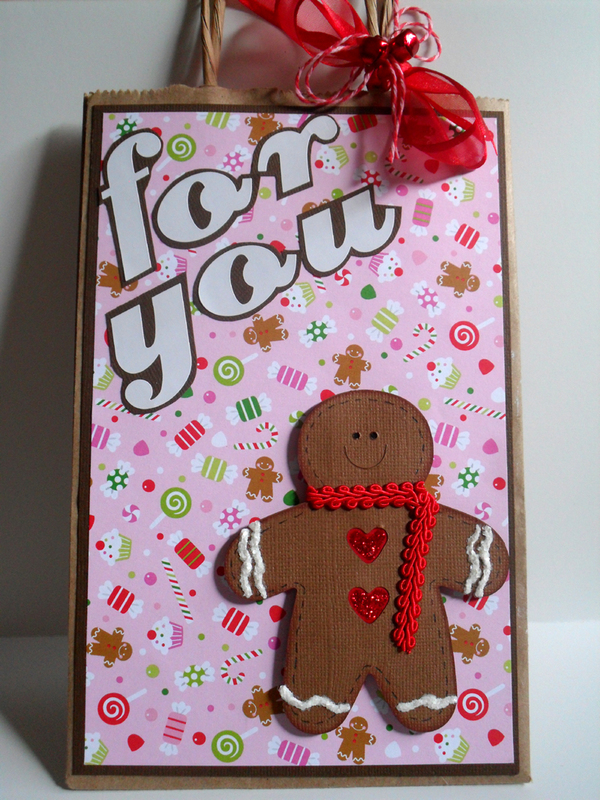 A while back, I cut a bunch of Gingerbread men from a Sizzix die and embellished them for a swap. I made extras to have on hand, and it sure helped to make this project go quickly. I started by matting some cute patterned paper by Doodlebug. I then glued to a plain Kraft gift bag. Next, I added the gingerbread man using dimensional foam stickers. My teenager wanted the words "for you" on the front of the bag, so I took white alpha stickers by American Crafts, stuck them on brown cardstock, and then fussy cut each letter before gluing to the bag. Sheer red ribbon, Christmas twine, and some red jingle bells hot glued to the bow were the finishing touch. I love pretty packaging, and I hope the recipient of this cocoa set loves it, too! Your giftbag is so cute! Very cute gift bag, Dena! 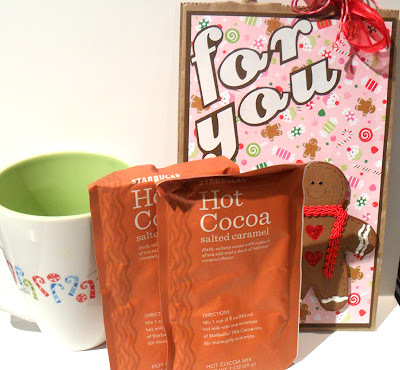 Your little cocoa holder is ADORABLE!! I love it. 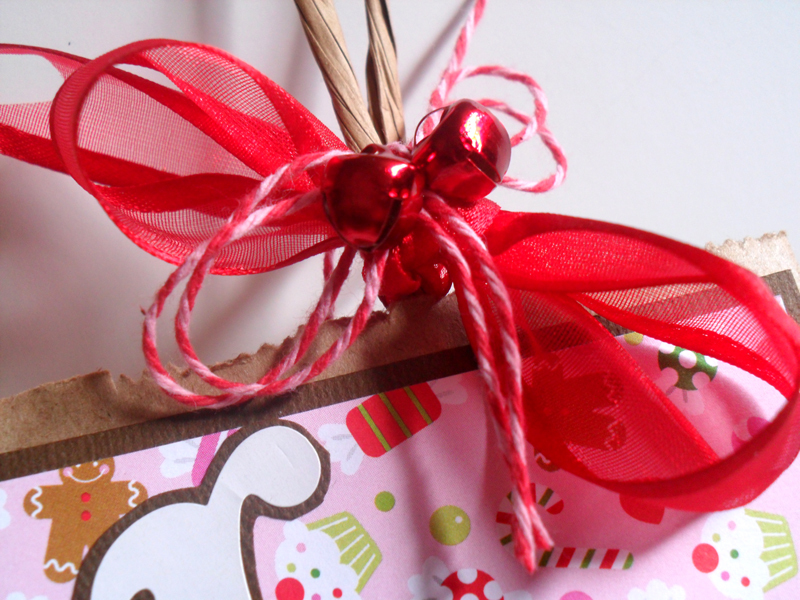 The bow with the twine and jingle bells are so cute. Thanks so much for sharing. Very cute project! I love the gingerbread man! This is great. The gingerbread man is too cute. I must find some of this cocoa mix. I love the salted caramel mocha at Starbucks. very cute!! Love gingerbread men and the jingle bells! Yum! Gingerbread and hot cocoa! Now that's a treat. Loved your project.